According to Chinese news outlet TaiHaiNet.com, the spider may have embedded into Li’s ear when the 25-year-old went for a hike with her boyfriend. After returning home that night, Li says she began hearing a strange scratching sound that was occasionally accompanied by a sharp pain in her ear. Li says she believed that she may have been "cursed" by evil spirits. According to Central European News, she "even went to a temple" to pray for the spirits to leave her. Li also took painkillers and anti-inflammatory medication to ease the pain, but none of the remedies seemed to work. About a week after the hike, Li visited Dr. Chen Zhao Ye, an ear, nose and throat specialist at the Xiamen Hospital of Traditional Chinese Medicine. During the examination, Chen discovered a spider living inside Li’s troubled ear. 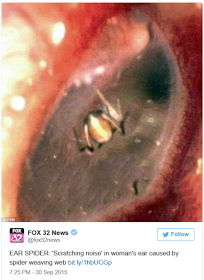 The spider had even been weaving a web inside the ear cavity. Removing the spider was reportedly a difficult and painful ordeal as the doctor's attempts caused it to react violently. Chen was only able to complete the task after subduing the spider with some anesthesia.